10mm Wargaming: Save 1,000 Acres at Waxhaws and Southern Campaign Battlefields! 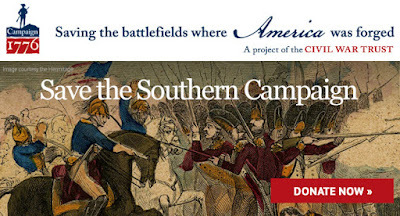 Save 1,000 Acres at Waxhaws and Southern Campaign Battlefields! Back in August, I told you about an exciting opportunity to save more than 1,000 acres of Revolutionary War battlefield land. This land, at five different battlefields, is the first land you and I have ever tried to preserve in relation to the Southern Campaigns of the Revolutionary War where most historians agree the war was won. Today, I want to focus on just one of those battles, the Battle of Waxhaws, a chapter in American history that you and I have the opportunity to commemorate by saving a significant portion of hallowed ground before it’s gone. Colonel Abraham Buford and roughly 400 Virginians were unable to reach Charleston, South Carolina, before it fell into British hands and began moving away from the city in the middle of May 1780. Sensing blood in the water, British General Charles Cornwallis sent a detachment of 150 dragoons under Lieutenant Colonel Banastre Tarleton to pursue the Virginians, catching up with the slow-moving Americans at Waxhaws on May 29. After Buford refused to surrender, Tarleton’s mounted troops easily overwhelmed the Americans, who lost more than 300 in the lopsided melee. Tarleton lost fewer than 20 dragoons. Though the Battle of Waxhaws may have been terrible defeat for the Americans, it served as a rallying cry for Patriots across the South. Reports that British horsemen massacred Patriot troops who tried to surrender cemented Tarleton’s reputation as a butcher. On October 7, 1780, Patriots were heard to cry “Remember Waxhaws!” as they pitched into Loyalist forces on the way to victory at the Battle of King’s Mountain. Today, I am asking you to “Remember Waxhaws” by helping to preserve 51 acres of that battlefield. When combined with the land we are also trying to save at Port Royal Island, Charleston, and Hanging Rock, this is our largest effort yet for Campaign 1776, and we need the help of people like you to make it a success.